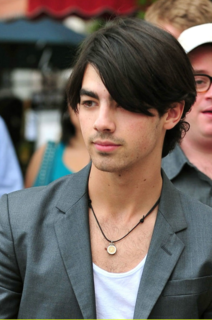 Joseph Adam Jonas was born August 15, 1989 in Casa Grande, Arizona. He, like his brothers, grew up in Wyckoff, New Jersey and attended Eastern Christian High School. When he was young, he never even considered a career in singing like his brother. He was all about the comedy. He wanted to star on a sketch comedy show like Nickelodeon's All That, although he has said that he had always had a love for music. Joe’s appearance in Baz Luhrmann's Broadway production of "La Bohème" was his first one as a singer. Joe said that watching his younger brother, Nick, perform on Broadway was what motivated him to want to give musical theatre a try. Since discovering his talent for musical performances, Joe has never turned back. After his brother, Nick Jonas', solo career as a singer had taken off, Steve Greenberg, president of Columbia records, heard Joe and his brothers singing and performing the song "Please Be Mine" written by all three. Daylight/Columbia Record decided to sign all of them as a group act. First big purchase: Nike Dunks. Favorite Junk Food: Mint and Creme Oreos. Favorite Band: Copeland and Switchfoot. Favorite Food: Chicken Cutlet Sandwich with Mayonnaise. Favorite Candy: Twix and Tootsie Rolls. Favorite Song: "Only Hope" by Switchfoot. Favorite Ice Cream Flavor: Chocolate Marshmallow. Out of his brothers, he is the loudest. Joe doesn't really like coffee, but he does like some drinks at Starbucks. He likes their Strawberries and Creme Frappuccino and the Passion Tea Lemonade. Joe is a big fan of the High School Musical movies. His acoustic guitar is called the Black Pearl. He once drove the tour bus and almost crashed it. Joe's most prized possession is his hair. 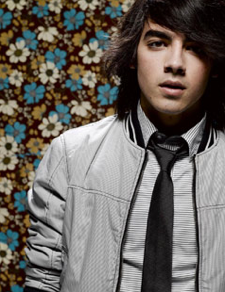 Joe uses a flat-iron and Evada Control Paste in his hair. Joe listens to Beethoven before going to bed sometimes. According to his brothers, Joe takes forever in the shower, takes forever to get ready and the asks how he looks about four times. Joe's favorite ice cream flavor is Chocolate Marshmallow. When Joe was younger, he once got his head stuck in his tambourine. Joe is a big fan of Penn State University college football. He says if he could live in any other past era, it would be in the 60's or 70's. Joe sleeps on a king-size bed. Joe (jokingly) thinks Miley Cyrus needs a straightjacket. Joe is known to have dated Mandy Vanduyne (the girl from the song "Mandy,") and Amanda Joy Michalka (of Aly and AJ.) He has been rumored to have dated numerous others including Chelsea Staub, Demi Lovato, singer JoJo, and an Australian model named Amelia. Joe has denied dating any of them.